I can arrange for you to have CT Coronary Angiography at Colchester Hospital or the Essex Cardiothoracic Centre. I have full accreditation to supervise and report CT Coronary Angiograms and lead the service at Colchester. 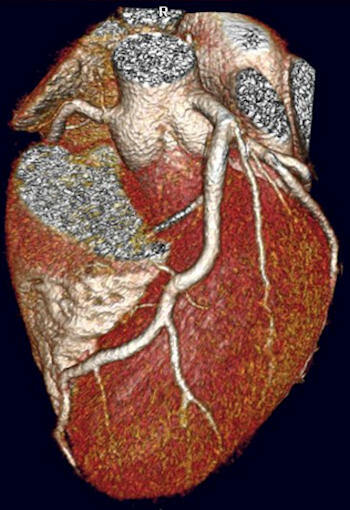 CT Coronary Angiography is a CT scan of your heart that allows your coronary arteries to be viewed in 3-Dimensions. It is most often used to look for evidence of coronary artery disease in patients with chest pain. NICE now recommend CT Coronary Angiography as the first line test for patients with chest pain who may have angina. You will be given a time to arrive before the scan itself. A nurse will insert a small plastic cannula in a vein in your arm – this allows us to give you contrast during the scan. The contrast fluid allows the CT scanner to see the blood in the arteries (as normal blood is invisible). You will be asked to lie on a bed in front of the CT machine. ECG stickers will be placed on your shoulders and body to measure your heart beat. In order to get good pictures of a moving heart, we need your pulse rate to be nice a slow. If your pulse rate is too fast, you may be given medication to slow it down using this cannula. Usually we use beta-blockers – please tell the team if you are asthmatic or are allergic to these. You may also get a few puffs of GTN spray or a tablet placed under your tongue – this helps open up the arteries. Once your heart rate has settled. you will be asked to raise your arms above your head. You will then go through some breathing manoeuvres prior to the scan – this is to ensure you can hold your breath long enough and to see what your heart rate does when you do this. You will then get a quick CT “scout” image of your chest – this allows the radiographer to position the scans so that just your heart is imaged. 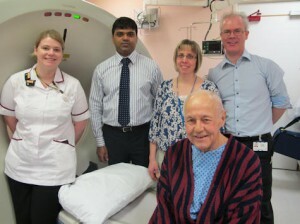 Finally, you will get the CT scan itself. You will hear some automated instructions about breathing in and holding your breath. The injection of contrast may feel warm inside – try and relax and keep holding your breath until the instruction to “breath away”. The scan is then finished. You will have the cannula removed and asked to wait for a period of time before you can leave. This is just to make sure you feel well after any beta-blocker medication and have no allergic response to the contrast. Depending on your heart rate before the scan, you may be given a few tablets of a beta-blocker to take in the day or two before the scan – the instructions will be provided by the radiology department. Avoid all caffeine for 12 hours beforehand so your heart rate is not increased. Take all your normal medication that day unless you have been given any specific instructions by the radiology department. Try to have had just a light meal beforehand and avoid much food for 4 hour prior to the test. Please avoid wearing much jewellery on the day, other than rings on your fingers – metal interferes with the scan and may need to be removed. The whole procedure from arriving to leaving can take between 60-90 minutes. The scan itself just takes 10-20 seconds but there is a lot of preparation required and a short period of observation after. Once you have had a period of observation, you are free to go. There should be no “after effects” so you can carry on with your normal routine that day and take your medication as normal. The scan itself will be reviewed later so the results won’t be available on the day. I review and report all my CT scans in conjunction with a Consultant Radiologist in order to provide a comprehensive result. Very rarely, contrast dye can cause an allergic reaction – if you have had any reaction to angiograms or CT scans before, please tell me or radiology staff in advance. Contrast can also put a strain on the kidneys if they are not working normally to begin with – you will have a blood test to check kidney function beforehand and if there is any problem, I will review whether to continue with the scan in discussion with you. Finally, since the scan involves x-rays, there is a small amount of radiation given during the scan. The amount varies from person to person and the type of scan involved but it is about the amount of background natural radiation you receive in 1-3 years. CT Coronary Angiography is a low risk test for looking at your coronary arteries (eg compared with standard coronary angiography, which involves tubes being inserted into your arteries). If the CT shows no evidence of coronary disease, this is a very reassuring result. If the scan does suggest you have coronary disease, you will need to start medication to reduce your chance of heart attacks and strokes. You may also need to have more tests to clarify how bad the disease is and this will be discussed with you at the follow up appointment.